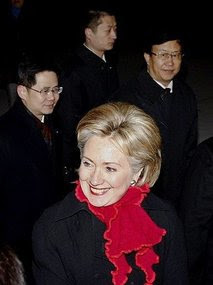 Secretary of State Hillary Clinton signaled to China, and by implication other regimes infamous for their human rights abuses, the green light to not worry about offending the US, because there are more important issues for the US, such as the economy. Human rights groups expressed shock at her comments. Despite Hillary's half-hearted attempt to claim the Obama administration will still bring up these issues when meeting foreign leaders, it is abundantly clear to all that human rights in countries like China is not considered a pressing problem and Hillary will raise the issue in a perfunctory, unserious way. The Chinese communist government must surely have been thrilled to hear this. And so other rogue regimes will take notice that this is the kind of "change" the world can expect from Obama. It's been a dismal first month for the Obama administration as foreign policy missteps and conflicting signals are the rule, rather than the exception. Meanwhile Wall Street continues to give Obama a no confidence vote on a daily basis. Since no one ever really thought Obama was more qualified to be president than his main rival, John McCain, and since more people didn't cast a vote on that basis, it should be no surprise that we are stuck with a president in over his head and lacking any leadership qualities useful for all the things that matter. Look out below.